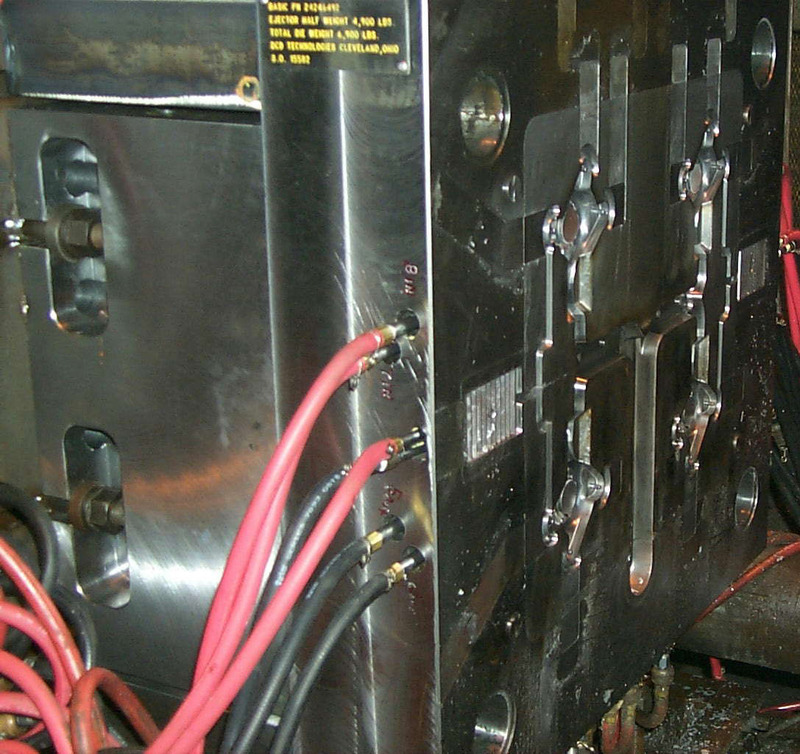 Die casting requires that aluminum is heated well into its liquid phase for injection. The melting point of aluminum is specifically dependent on its alloy, but generally full liquid phase is met at above 1100 degrees fahrenheit. Aluminum temperatures generally must be taken several hundred degrees higher than this in order to assure that alloy chemistry is maintained. Basic melts its aluminum in central natural gas fired reverbatory furnaces. Basic uses ingot purchased from qualified aluminum smelters and will also re-melt excess material from the casting process. Alloy chemistry is checked on a routine basis to ensure that metal chemistry meets alloy specifications. Once melted and taken up to proper temperature, the aluminum is transferred to each die cast machine. Basic utilizes a patented filtration method to take out impurities and oxides of the liquid aluminum as the aluminum is pumped out of the reverbatory furnace. Each die cast machine has its own holding furnace which maintains the molten aluminum at temperature waiting for use in the die cast machine. When a die cast machine is ready for its next cycle (die is closed ready for shot), an automated ladle removes a prescribed volume of molten aluminum from the holding furnace and pours it into the shot sleeve. Once pouring is complete, the injection phase begins. The first injection phase is the slow shot phase where the shot plunger moves forward at a low speed to begin pushing air out of the sleeve and to move past the pour hole in the sleeve. After a prescribed distance, depending on process set up, the plunger enters an intermediate speed phase where the speed is increased to fill the runner system with aluminum. Once this is complete, the machine enters a fast shot phase where velocity is greatly increased to fill the part cavity with aluminum. After the part cavity is filled and the plunger has stopped moving, the hydraulic cylinder pushing the plunger is pressurized to a higher pressure. This intensification or squeeze phase takes the aluminum pressure over 10,000 psi to ensure proper fill and to minimize aluminum shrinkage problems. The die cast machine continues to hold the die halves together at its rated tonnage during the solidification phase. Die cast dies are water or oil cooled to remove heat from the molten aluminum during solidification. The machine also maintains intensification pressure to minimize shrink porosity as the aluminum solidifies. After a prescribed amount of time (where the casting has sufficiently solidified and cooled), the die opens the ejector or moving half of the die. Once the machine is fully open, the die cast ejection is triggered. Die cast dies have ejector pins through the part cavity. This pins are mounted in an ejector plate on the back of the die cast tool. This plate is actuated by hydraulics on the die cast machine. Once ejection has moved fully forward, castings are removed by an automated machine or 6 axis robot. This device then takes the die casting to cooling equipment where the part is taken to a temperature suitable for subsequent operations. This cooling can be achieved with fan driven air cooling or the parts can be water quenched. Quenching reduces casting temperature more rapidly, but the process must be controlled to prevent part distortion. After the die casting is taken out of the die cast tool, another piece of equipment automatically lubricates the die. These lubricants are die cast specific, usually a mix of custom silicones, emulsifiers and water. This lubricant serves to both cool the die surface to proper temperatures for the next cycle and create a film on the die surface which allows for part release. Once complete, the die cast machine closes and is ready for the next cycle.